Eagle Scout candidates plant a tree to shade one of the new benches in Lima’s Mark Tubbs Park. The Village of Lima (in Livingston County, south of Rochester; pop. ~ 4300) selected Saturday April 14, 2018 for its first-ever Arbor Day planting event. 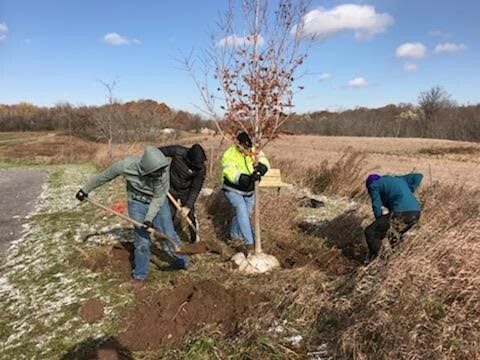 This date coincided with the pick-up dates for the Livingston County Soil & Water Conservation Tree & Shrub Seedling Program, the source of some supplies needed for the Arbor Day event. Lima was one of 13 communities selected to receive an Arbor Day grant from the Council. Thank you to Tom Cavataio, Member of the Freeville Village Planning Board and Tree Committee, for this excellent report. 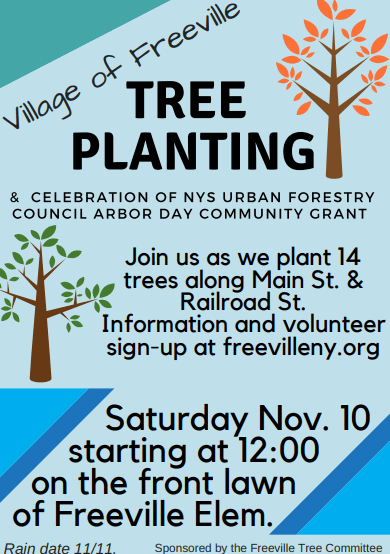 Another successful tree planting in the Village of Freeville took place on Saturday, November 10th, 2018. You may have read in a previous blog post that we hosted a limited planting in May 2018. The planting was limited due to the lack of availability of the narrow-growth crabapples that we selected to plant this year. The Tree Committee met in July to confirm the varieties of the crabapples as well as a small number of cultivars of two native hardwood species that we would purchase bare root: red maple (Acer rubrum ‘Karpick’) and swamp white oak (Quercus bicolor ‘Beacon’). The goals were to beautify the areas of plantings, employ the traffic-calming effect of trees planted in the school zone, and also to replicate to a certain degree the taller-growth trees that many long-time village residents recall from years past (something of a challenge, given that a lot of infrastructure now exists in that area that did not decades ago). The July meeting also yielded a tentative timeline for ordering and taking delivery of the trees, which we planned to plant the first or second Saturday in November. Gloversville, New York, located in Fulton County halfway between Albany and Utica, was a recipient of a 2018 NYSUFC Arbor Day Grant. These grants are meant to kick-start community and urban forestry programs. 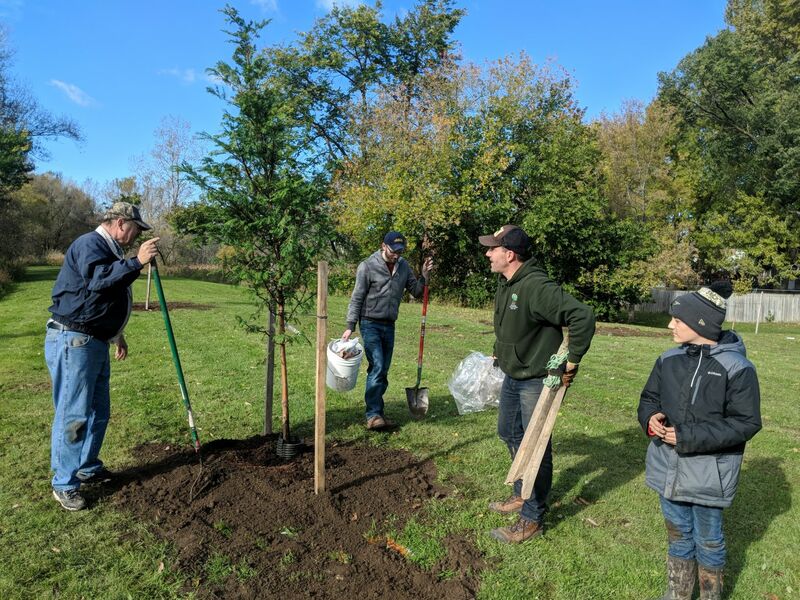 Over the course of three events held in April, May, and June, 2018, the Gloversville Housing and Neighborhood Improvement Corporation (GHNIC) planted twelve trees in celebration of Arbor Day. Through these events, more than two dozen community members were involved, the public learned more about urban forestry through four stories in local newspapers, and community members expressed interest in forming an urban forestry committee. Since originally applying for the $1000 grant, the City’s tree planting project underwent two significant shifts. The first was a shift in location. Though they had originally sought to plant trees along land-banked parcels, GHNIC folks later decided that planting trees in the “asphalt desert” that surrounds the Gloversville Farmers Market Pavilion in the heart of downtown was a better way to showcase the benefits of trees in a highly visible part of the city.